Be the first to share your favorite memory, photo or story of C. Nelson. This memorial page is dedicated for family, friends and future generations to celebrate the life of their loved one. Dr. C. Nelson Grote, 91, the 11th president of Morehead State University and husband of the late Wilma Grote, died early Saturday, Jan. 19, 2019, at his home in Morehead. He retired from MSU in 1992 after serving five years as president. A former college dean at MSU, the Illinois native held two other presidencies before returning to Morehead in 1987. Following his retirement from MSU, Dr. Grote was a consultant in the formation of the Kentucky Community and Technical College System. He served 10 years as president of Schoolcraft College in Livonia, Michigan, and six years as chancellor of the Community Colleges of Spokane in Washington State. His wife, the former Wilma Ellen McGee, died Aug. 18, 2018. 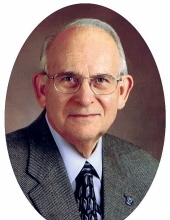 Dr. Grote was born Jan. 6, 1928, in Oconee, Illinois, a son of the late Charles and Elizabeth Luce Grote. He and Wilma were married Jan. 6, 1949 and graduated from Eastern Illinois University together in June 1950. Dr. Grote is survived by three children, including two daughters, Carol (Skip) Vencill of Lexington, Jan (Dave) Adam of Seattle, Washington, and a son, Mark Grote of Davis, California; four grandchildren, Jamie, Jessie, Matt and Zach; and six great-grandchildren, Wynne, Linnea, Brody, Cora, Luca and Emilia. Another son, Steven, died in 1973 at age 7. Dr. Grote first came to MSU in 1960 as an associate professor and chair of the Division of Applied Arts. He earned his doctoral degree at the University of Illinois, his master’s at the University of Missouri. In 1978, he received the Distinguished Alumnus Award from EIU. MSU's Alumni Association conferred "honorary alumnus" status on Dr. Grote and his wife and inducted him into the Alumni Hall of Fame. Upon his retirement, the MSU Board of Regents awarded him the title of president emeritus and conferred an honorary doctorate. Grote-Thompson Hall, home of MSU’s Craft Academy for Excellence in Science and Mathematics, was renamed in his honor, as was a building at Schoolcraft College. A charter member of the Morehead Optimist Club, he was a life member of Optimist International. He also was a U.S. Army veteran. Visitation for Dr. Grote will be Friday, Jan. 25, 2019, at the Morehead First Christian Church (Disciples of Christ) from 12 p.m. to 1:30 p.m. with interment in Lee Cemetery at 2 p.m. with the Rev. Don Chase officiating. A Remembrance Ceremony will be held at 3:30 p.m. Friday in the Adron Doran University Center Theatre with presentations by MSU President Jay Morgan, Rev. Don Chase, Mark Grote, G. R. “Sonny” Jones, Jr., and Keith Kappes. A reception will follow in the Griffith Alumni Library. Pallbearers: G. R. “Sonny” Jones, Jr., Glenn “Skip” Vencill, Mark Grote, Matthew Jones, Joseph Ireland, Kyriacos Kyriacou, Wayne Fields, Eli Hosselton. Honorary pallbearers: John and Betty Philley, Porter and Pat Dailey, Ron and Patty Griffith, P. D. Fields, Nelson and Wilma’s special caregivers, and much-appreciated University colleagues. In lieu of flowers, memorial contributions are suggested to the C. Nelson and Wilma E. Grote Scholarship Endowment, Morehead State University, MSU Foundation, 150 University Blvd., Box 1887, Morehead, KY 40351. To send flowers or a remembrance gift to the family of C. Nelson Grote, please visit our Tribute Store. "Email Address" would like to share the life celebration of C. Nelson Grote. Click on the "link" to go to share a favorite memory or leave a condolence message for the family.